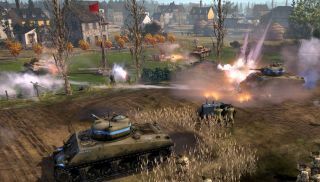 Company of Heroes 2: The Western Front Armies is out, and, as explained in our review , provides welcome rejuvenation to Relic's strategy sequel. In this new trailer, the game's executive producer Greg Wilson explains the standalone expansion's* new War Spoils feature. Also he jumps out of a plane. War Spoils are rewards earned for playing the game. You can get new commanders, passive buffs or cosmetic skins—and Relic plan to expand this system in the future, with even more types of bonus content. As mentioned in the video, right now, there's also free paratrooper faceplate to be nabbed. Head here to secure your loot. *I was going to use the word "expandalone" here, because "expandalone" is a brilliant word. Unfortunately, I am alone in holding this opinion.